I am on a deadline. I have a speed awareness course in just over an hour. If I’m late I’m not allowed to do it and I get three points on my license because I was doing 39 miles per hour in a 30 limit. I won’t get my £95 course fee back either. My sister will be cross because she got caught speeding too and we’re going together. I have a post all written but this – well, it’s too good not to share. On Christmas Day I published a post entitled A ShortAntidote to Christmas Cheer. It was the perfect way to dispel the sachcarine sweet Christmassy joy: it was a gentleman scowling at a camera. You can find him here. I should read this before you read on. He was supposed to be a tourist attraction and I chortled inwardly because tourist attractions are not meant to scowl at cameras. Last night a comment appeared in my comments box. The beefeater had found his picture: and to my HUGE relief he has no plans to clap me in the tower for being saucy. He is none other than Mark Anderson. He is a former Penzance man with tours in Bosnia and Northern Ireland under his belt. For a happy Mark have a look here at the snappily titled Mark’s joy at being a beefeater From ThisisCornwall.com. But he has proved he has a sense of humour. “Dear Kate,” he writes, “I stumbled over this photo and was in hysterics. “I have a great sympathy for this fine looking chap and I intend to use the photo if I may as my Facebook photo – because it is I. I am the guilty beefeater. So there it is. Not only is this true gentleman of the tower a self professed cheerful chap, but he came up with a killer gag to prove it. You have your proof. Yes, Mr Anderson: please feel free to use the photo. Your good will is much appreciated. 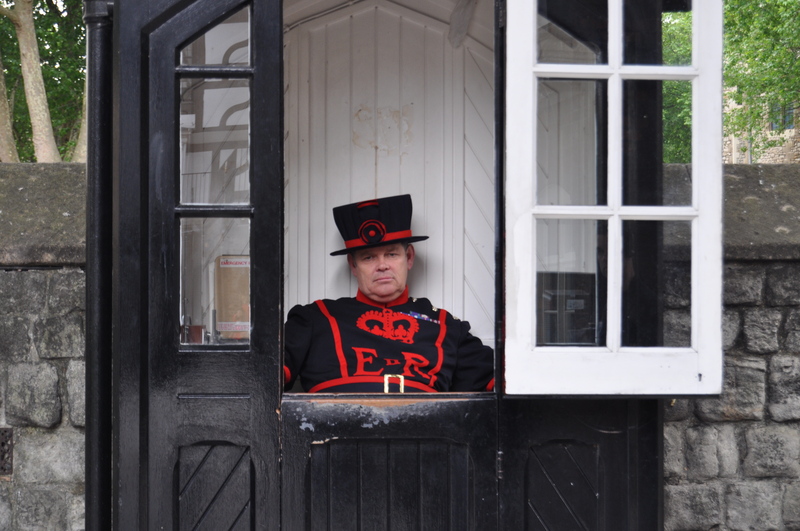 Posted in London, WhimsyTagged beefeaters., mark anderson, the tower of london, tourismBookmark the permalink. Hahaha.. this totally made my day. That and I’m so tired, I’m sure my own expression matches his!! We all have those moments, don’t we, Barbara? Hope your day improves! I like Mark Anderson. his humour matches yours – what a great way to complete the circle – and Kate, you and your sister have been very naughty – speeding in your big Merc. A true gentleman indeed 😀 Never judge a man on first appearance eh? Quite 🙂 What a nice bloke. I shall be heading back for a smiley portrait very soon. What a great guy.. Who hasn’t felt like this on some days? A truly disgruntled employee would ‘be shown the camera the 1 fingered salute of disrespect. I hope you appeared happier than Mark when you finished your speed awareness course. but I have to ask: did you get to your speed awareness course on time, without speeding to get there? *Coughs non commitally* Would I speed on the way to a speed awareness course, Pseu? Glad to see that your dour Beefeater is in fact a jolly old elf, his photo in the accompanying post is quite cheerful indeed. I know, Lou 🙂 Nice smile. Look out for Mark if you’re ever at the Tower! Everyone looks miserable when the face is in repose. Look at our own dear Queen for the best example. “Speed awareness course;” such polite terminology. 🙂 Hope it went well. We’ve been watching the new PBS series “Queen & Country.” The most recent episode was all about “peculiars of the crown” — the swans on the Thames, the Tower of London, the Channel Islands, etc. Now I need to review that episode to see whether Mr. Anderson may have been one of the Beefeaters who was interviewed. What fun that he contacted you and added to your tale! I’ve been watching “Queen & Country” as well, Karen, and truly enjoyed the peculiars of the crown. I love it when these things happily happen, Kate. Isn’t it great fun to suddenly hear from the object of a blog in a pleasant way? Mr. Anderson sounds like a very fine man and another layer is added to a Shrewsday tale. Tea and shortbread has been had, Penny 🙂 Feel better now…..
That’s fantastic. I can’t blame Mr. Anderson for looking and feeling like that after being subjected to zillions of idiot tourists all day, with a hangover. He sounds like a nice guy. I’d have a pint with him. I intend to return to the scene of my crime, Mme W, with a box of homemade shortbread (I think they can’t drink on duty)….in our defence some of us tourists are quite nice. Not the bloggers, so much…. I laughed at Christmas and I’m laughing again 🙂 It’s a fab pic, and how lovely of him to comment! I hope you’re both safely home, pointless. We are. Like a broken pencil, as Blackadder would say. It does match rather well, doesn’t it, Ruth? I expect frowns were required uniforms there for centuries. Dear Kate, I read your December post and today’s and the article about Mark the Beefeater, and I just feel happy. You’ve lightened my day. (A day with the temperature at 106 degrees F. Thank you for this romp through the Tower of London (December) and for introducing us to Mark, a true gentle-man. Peace. I tip my glass of Beefeater to Mark for being such a sport. I agree. Great bloke, Lameadventures. Any sign of the air conditioning fairy yet? No, he hasn’t come around to my hovel, but Mother Nature cut me a break. At the moment it’s a cool clammy 63 here in Gotham. My hair looks like a big brown storm cloud but I’m okay with that. I also know these cool temps are temporary. The world is such a small place when we put things online. I think it is so cool that he found it. (Did he tell you what he sought in the process?) It sounds like he has a heaping sense of humor, and it’s great that he got a slot at The Tower. Clearly he was the right man for the job, Andra. No: I don’t know yet what he was looking for…maybe I’ll ask him when I turn up for that smiley photo…. Ninety five pounds! I’d take the three points, thank you! When I first saw the picture of that lad at Christmas I didn’t think he was THAT grumpy – just a lack of Yorkshire Pud to go with the beef, perhaps. Or the sort of tourists that drive one dilly. I do love his response. I feel extremely chuffed to have had his response, Col. Thanks be to God for humorous and understanding people! That’s certainly one of the craziest stories I’ve ever heard! How cool that he found the pic though! It is, Debra, but needs must:-) It was a very good course…I am extremely grateful he has a sense of humour too! I am SO proud he’s Cornish. You’re Cornish too? I’m listening to swifts chattering on the wires on the edge of Bodmin Moor as I type. Remote, beautiful part of the world. Are you on holiday here? If so, good timing! It’s a shockingly beautiful weekend. I’m listening to wood pigeons cooing on the otherwise silent old street where Murdoch had the first ever gas-lit house. We are lucky. It’s almost Camborne – the next one along. Just got back from Fowey and Golant – it is so beautiful out there it makes you glad to be alive! I’ll shut up before I make myself throw up. I’ve had a similar experience, but on a more somber note. I wrote about a woman bush pilot in the North who I’d befriended. She wanted me to write her life story, but she was killed in a plane crash (she was not piloting) before she gave me details of her (English) childhood and background. Her brother wrote a comment that he was writing her story. He knew I wasn’t, but kept wanting to meet me. He wanted information about an incident I knew nothing about. My intuition signaled that there may have been a push to get money from someone his sister had helped before her death. My intuition led me to retraining my anonymity. Hope all is well with your license. The Internet is a funny old place, isn’t it, Amy? Cloaking is always a possibility. It seems I’ve saved up my Kate-reading treats for the right morning. A smile with my iced tea was just the thing. Well played, Mark Andersen! Love his article, too. Can you even imagine? Locking the Tower? Being part of 700 years of tradition? Whoosh. Hope your speed awareness course went well.